"The whole art of teaching is only the art of awakening the natural curiosity of young minds for the purpose of satisfying it afterwards." 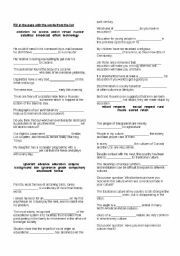 "Anatole France"
This worksheet is meant to keep the students involved and concentrated on one Topic " culture" ( vocab , discussions ( opinion , picture talk ) matching exercises and writing an e-mail about a local ceremony . Hope it might be of good help . Useful Business Vocabulary for intermediate Learners . Gap filling exercises . 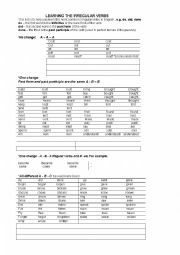 Theme based vocabulary gap filling exercises . 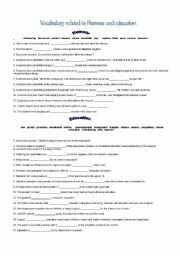 Test assessing vocabulary related to careers , Banking , modals ( request , ability, offers ) , formal informal phone language , as well as a writing activity (e-mail ). Women related vocabulary: "Gap Filling exercise"
One in a series of theme-based gap-filling exercises. Hope it helps . 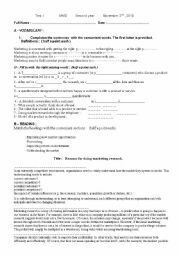 This sheet may work both as focused class activity or as a test centered around "english for Marketing" I hope it might be beneficial to you . Learn your lesson II. These types of stories are meant to motivate learners to speak after reading the story . Hence , using the language to convey a message about one�s life, one�s experience ......Hope you enjoy it . 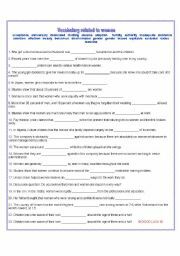 "Story taken from the net "
Irregular verbs made easier to memorize through putting them into categories and families.